VISITORS Falkirk outplayed Dumbarton in a 5.30 kick-off match at the Bet Butler Stadium, and deservedly won 3-0. VISITORS Falkirk outplayed Dumbarton in a 5.30 kick-off match televised by BBC Alba at the Bet Butler Stadium, and deservedly won 3-0. A crowd of 664 attended on a mostly wet evening, hoping that Sons could make it three wins in a row and close the gap on their full-time opponents, but it was not to be. 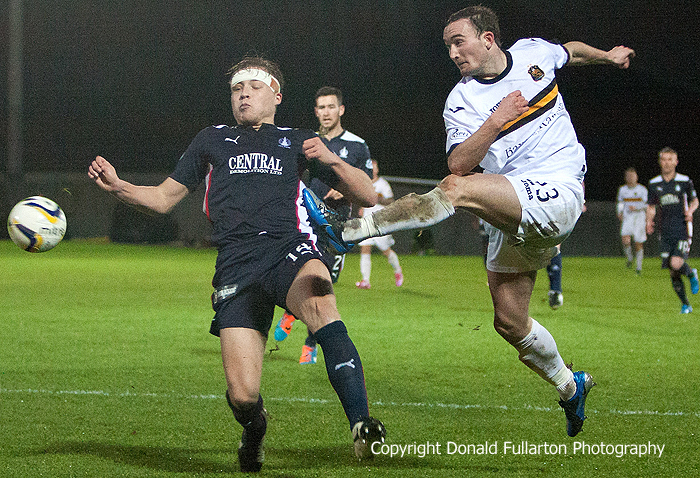 The Bairns, managed by former Sons player Peter Houston, were in fine form and totally dominated the first half. After a few minutes prolific striker Rory Loy slipped the ball past keeper Danny Rogers to open the scoring. At the other end the best chance fell to Steve McDougall after a fine run and cross by Chris Kane, but his shot went over the bar. After half-time the home side made a real game of it for the first 30 minutes and were unlucky not to score on several occasions, particularly when a Scott Agnew shot hit the post and bounced back. But they were leaving holes at the back, and they paid the price in 80 minutes when Blair Alston broke through and made it 2-0. Soon after Craig Sibbald clinched the points with a third. Sons striker Chris Kane (pictured) had several efforts on target, but could not beat keeper Jamie MacDonald.